In Wales the owl is called Blodeuwedd - which means flower face. In the Medieval Celtic tale "the Mabinogion", Blodeuwedd is magically created by magicians from stone and flowers for Llew, who is cursed that he should have no human wife. She was beautiful, fragrant as the wildflowers from which she was sculpted. However, one day when Llew was away, Blodeuwedd offered hospitality to a group of huntsmen, and she fell deeply in love with Gronw. By choosing her own lover, Blodeuwedd was in grave danger, so with Gronw’s help, they tricked and killed Llew, and escaped into the wild forests to live happily together - for a while. When the magician Gwydion heard the story of her betrayal, he changed Blodeuwedd into an owl, banishing her into the dark wooded night. 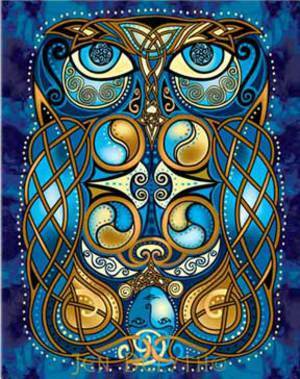 Blodeuewdd becomes the wise all-seeing owl whose intuitive vision peers deep into our psyche.